List of Boomers and Seniors events taking place locally. You'll find the list of where I will be giving various events during the months on this page -- some are free talks and some are seminars. Call me or send an email using my contact form to hold an event in your organization or group... or drop in at any of these listed below at the locations indicated. Looking forward to see you there and speak with you. A new series will be presented in Fall of 2014. Watch for the topics coming up soon! 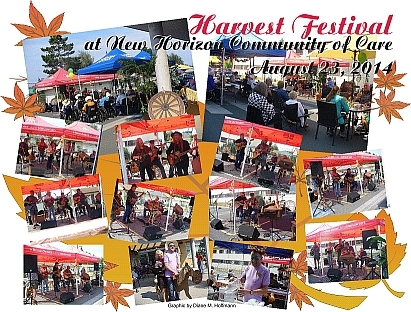 I want to thank "New Horizon Community of Care" for holding an annual "Harvest Festival" for their celebration of their senior residents and the community. I was privileged to be able to provide the music program for the 3rd year again this year. We all had a wonderful time, especially giving an opportunity for fellowship with the seniors and their family. And thank you to all those who provided the music that went on from 11 am to 4 pm, and the volunteers, and Thrifty Foods and London Drugs who provided the tents. The residents say "Thank You". "The Role and Support of Caregivers in Today’s Growing Senior Population." There will be more events coming up... check regularly. Local only... Wednesday, February 20, 2 to 3:30 pm pm -- at the Campbell River Library. Sign up for the free e-course by filling in the form at the top right of this page.